Read about Party Girl Diet™ book author Aprilanne Hurley’s NEW Aloha Diet™ coming out in 2017 here. Now it’s more fun than ever to “Keep the party going…while you lose the weight” this season with your copy of The Party Girl Diet™ and FREE Kindle Edition available on Amazon.com. The Party Girl Diet™ by Aprilanne Hurley is enrolled with Amazon’s “kindle matchbook ” book bundling program. Amazon’s MatchBook program, which is available on Amazon.com, allows authors and publishers to offer heavily discounted or even FREE Kindle editions of their print books to past and future purchasers. Read the Kindle edition on any Kindle device - or on your PC, Mac, iPad, Android tablet, and mobile phone with a free Kindle Reading App. More good news for the Party Girl Diet™ community…people who have already purchased The Party Girl Diet through Amazon.com are also entitled to receive a FREE Kindle/E-book Edition of The Party Girl Diet. That’s right. If you have already purchased the paperback form in “new” condition of The Party Girl Diet you will be eligible to claim a FREE Kindle/E-book Edition of The Party Girl Diet on Amazon.com starting today. Click here to “Like” Party Girl Diet on Facebook for access to great recipes and Party Girl Diet fitness tips. Happiness is getting the best of the top 3 rated diet books in the US in 1 fun, healthy weight loss plan. Discover The Party Girl Diet’s healthy, sustainable lifestyle that let’s you lose weight while you are having the time of your life. 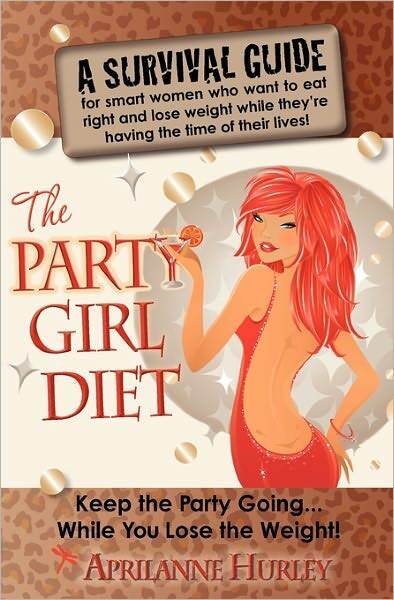 “Keep the Party Going…While You Lose the Weight” with The Party Girl Diet! The Party Girl Diet Kindle/E-Book Edition is offered at the special price of $6.98 to promote delicious, healthy eating and living. Now is the perfect time to discover The Party Girl Diet’s 9 PRICELESS Keys to Good Living™ – which include the importance of stress reduction & management. Order your paperback copy of The Party Girl Diet on Amazon for just $8.98 today and get FREE 2 Day Shipping With Your Amazon Prime Account!